The Chaos Sanctuary is the final level of Act IV (Hell), and lair of Diablo. The Chaos Sanctuary is the home realm of Diablo, where he has returned to in order to recuperate after turning the Dark Wanderer into his own red image. Still weakened from the whole ordeal, he has locked himself in under five magical seals, guarded by some of his trusted lieutenants. The Chaos Sanctuary is the last level in Act IV, and always has a similar layout. The five seals to release Diablo are distributed among three arms of the Chaos Sanctuary, each of which may have two layouts for a total of 8 possible floorplans for the level. In each arm, activating one of the seals releases a superunique monster with minions, and all three super-uniques must be defeated in order to release Diablo. Grand Vizier of Chaos and minions. You always enter from the South-West, where there are no seals. Two seals are at the end of the North-West arm, where activating one of the seals releases the Grand Vizier of Chaos, a unique Storm Caster. One seal is at the end of the North-East arm, and activating that seal releases Lord De Seis, a unique Oblivion Knight. The last two seals are at the end of the South-East arm, where activating one of the seals releases the Infector of Souls, a unique Venom Lord. Monster levels are usually always equal to the area level with exception to uniques (mlvl +3) and champions (mlvl +2). 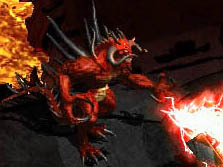 Before the Lord of Destruction expansion was released, the Chaos Sanctuary was one of the most frequently run areas of the game because of its constant layout and high experience, and also because Diablo provided some of the best item drops in the game. Now there is more experience to be had in the Bloody Foothills in Act V, and Pindleskin has better drops and is easier to get to, so the Chaos Sanctuary doesn't get nearly as much foot traffic as it used to receive. This page was last edited on 21 July 2011, at 11:02.